It is difficult to gauge how many Windows Phones are really out there. It is nearly impossible to breakdown how many are out there by manufacturer. 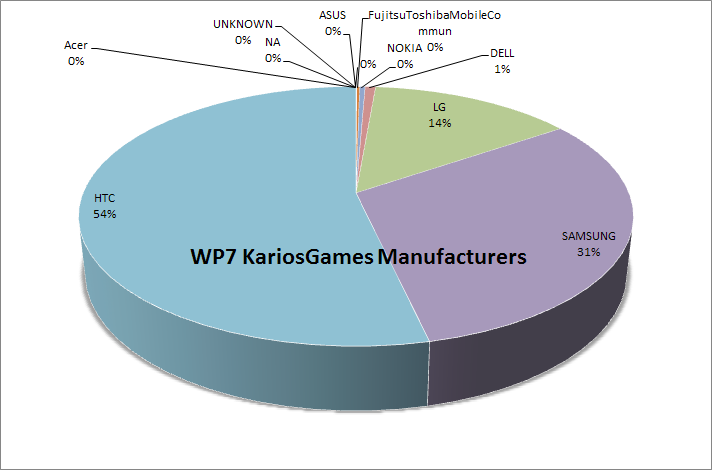 Karios Games though has kindly made available their game data from over 300,000 game downloads. What do the number show? They show that HTC and Samsung are still way ahead of everyone else as far as Windows Phone sales are concerned. We also have to take notice though that their top game MonsterUp (which is awesome btw), has not been promoted on the Windows Phone Marketplace since Nokia has made their Windows Phones available. It will be fun to see how this pie chart takes shape a few months into 2012. Written by: Hyde13 on December 28, 2011. Not really a fair comparison, I don’t even have their game (games? ), 300,000 is a heck of a lot though. I think in the second quarter WP was about 8 million as a conservative estimate. For about 6 months in the marketplace that’s pretty good. Some tech reviewers and users have unreasonable expectations and don’t understand, economically, WP wasn’t going to take off like crazy in 1 year. It’ll definitely get bigger in its second year.